The decay in leadership and family system in Nigeria is the major cause of moral perversion that leads to corruption in the youth that are considered to be the future of Nigeria. Acting Chairman of Independent Corrupt Practices and Other Related Offences (ICPC), Dr. Musa Usman Abubakar, represented by Mr. Hassan Salihu of Public Enlightenment Department, stated this during a student’s outreach to commemorate the African Anti-Corruption Day at the University of Abuja, organized by Good Governance Team in collaboration with the Centre for Corruption Studies of the university. Dr. Abubakar further stated that infusing character in teaching and learning is necessary for building virile youths with integrity, who would drive the country’s socio-economic and political development to greater heights. 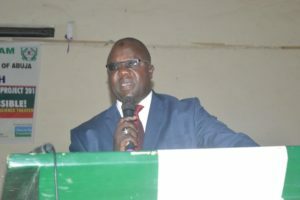 Hence, according to the ICPC Boss, the Commission in collaboration with the Nigerian Educational Research and Development Council (NERDC), had developed the National Values Curriculum (NVC) aimed at inculcating sound moral values and national consciousness in the Nigerian youth right from the formative years in school. The Acting Chairman added that other platforms provided by the Commission for the participation of Nigerian youth in the fight against corruption are Schools Anti-Corruption Clubs (SAC), Students Anti-Corruption Vanguards (SAV), NYSC/ICPC Anti-Corruption Community Development Service Groups, Youth Integrity Camp (YIC), Youth Competition (YC) and National Anti-Corruption Volunteer Corps (NAVC). In his remarks the Chairman of the occasion, Hon. Justice Sulaiman Galadima, who is the Chairman, Corruption and Financial Cases Trial Monitoring Committee, said that the anti-corruption struggle could be enhanced if younger generation understood that the country belonged to them. He urged the youth to intensify commitment to move the country forward as they had the potential to combat corruption in its entirety. Earlier, the Director, Centre for Corruption Studies, University of Abuja, Professor Emmanuel Danladi, had said that the essence of organizing the event was to sensitize the students to carry the message of anti-corruption campaign in order to reduce the menace. Professor Danladi added that the fight had become necessary as youth participation in malpractices and other social vices had seen an upward spiral.